The story of the Soviet occupation of Afghanistan is well known: the expansionist Communists overwhelmed a poor country as a means of reaching a warm-water port on the Persian Gulf. Afghan mujahideen upset their plans, holding on with little more than natural fighting skills, until CIA agents came to the rescue with American arms. Humiliated in battle, the Soviets hastily retreated. It's a great story, writes Rodric Braithwaite. But it never happened. The Russian conscripts suffered badly from mismanagement and strategic errors, but they were never defeated on the battlefield, and withdrew in good order. 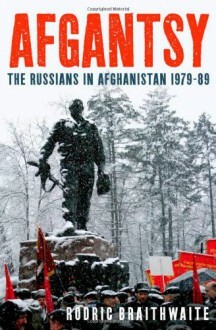 In this brilliant, myth-busting account, Braithwaite--the former British ambassador to Moscow--challenges much of what we know about the Soviets in Afghanistan. He provides an inside look at this little-understood episode, using first-hand accounts and piercing analysis to show the war as it was fought and experienced by the Russians. The invasion, he writes, was a defensive response to a chaotic situation in the Soviets' immediate neighbor. They intended to establish a stable, friendly government, secure the major towns, and train the police and armed forces before making a rapid exit. But the mission escalated, as did casualties. In fact, the Soviet leadership decided to pull out a year before the first Stinger missile was used in combat. Braithwaite does not, of course, paint the occupation as a Russian triumph. To the contrary, he illustrates the searing effect of the brutal conflict on soldiers, their families, and the broader public, as returning veterans--the Afgansty of the title--struggled to regain their footing back home. A fine writer as well as an expert, Braithwaite carries readers through these complex and momentous events, capturing those violent and tragic days as no one has done before.